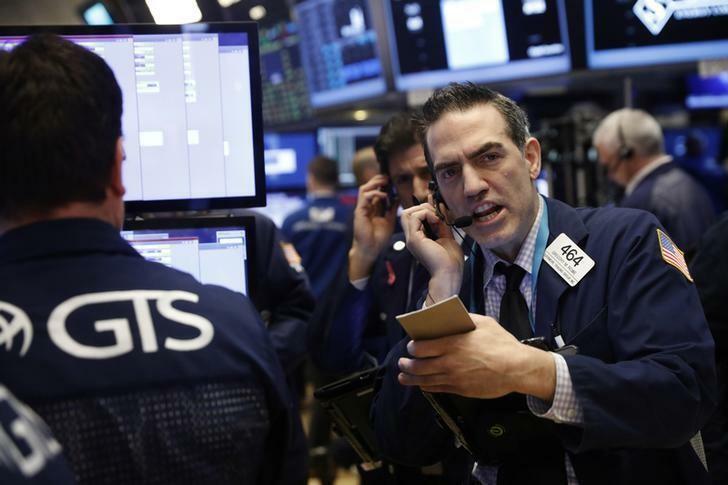 NEW YORK (Reuters) - European stocks advanced on Friday, while the S&P 500 and Nasdaq rose in line with gains in U.S. Treasury yields, as investors were encouraged by upbeat bank earnings and positive U.S. economic data. Investors largely shrugged off the biggest fall in Chinese exports since 2009 to focus on U.S. data that suggested stronger growth. Market participants largely resumed buying across equity markets based on higher growth expectations that had tailed off this week, with bank shares leading the way. Top U.S. bank executives, in their first public comments about quarterly earnings, expressed optimism about the outlook for this year as leading financial institutions recorded profits for the fourth quarter. Bank of America Merrill Lynch (BAC.N), for instance, reported a 47-percent rise in fourth-quarter profit, while JP Morgan Chase (JPM.N) also reported strong earnings, with a 24-percent rise in profit. U.S. economic data have also boosted the market, as retail sales rose in December given strong demand for automobiles and furniture. Producer prices expanded as well. "Our medium-term view is still positive on the stock market," said Allan von Mehren, chief analyst at Danske Bank in Copenhagen. "Donald Trump is seen as a positive factor for stocks in the longer term as he begins to execute on his plans of reducing taxes and rebuilding U.S. infrastructure." The Nasdaq Composite (.IXIC) added 0.48 percent to a record-high close of 5,574.12, bringing its gain so far this year to 3.55 percent. The Dow Jones Industrial Average (.DJI) slipped 0.03 percent to 19,885.73, while the S&P 500 (.SPX) gained 0.18 percent to 2,274.64. The dollar, meanwhile, was down 0.16 percent against a basket of major currencies at 101.19 (.DXY), but was off a five-week low hit this week. The greenback was down 0.2 percent at 114.54 yen (JPY=). The dollar index, though, posted its worst weekly performance in more than two months. "Markets, overall, have stabilized following the post-Trump press conference shake-up," said Action Economics in its latest blog. "Some consolidation is expected now (in dollar/yen), though should data continue to strengthen, keeping Fedspeak leaning to the hawkish side, dollar/yen upside can be expected to resume." The 'reflation trade' that had sent the dollar to a 14-year high last month was based on Trump's campaign promises of increased fiscal spending, lower taxes, and deregulation, all of which are inflationary and would likely drive the Federal Reserve to raise interest rates faster than its normal pace. U.S. Treasury yields rose across the board, bolstered by Friday's better-than-expected data, led by U.S. retail sales, producer prices, as well as the big rise in U.S. inflation expectations as shown in the University of Michigan consumer sentiment report. Benchmark U.S. 10-year yields fell 10/32 in price, yielding 2.4 percent , up from Thursday's 2.361 percent. German 10-year bond yields were also higher, up at 0.264 percent, from 0.234 percent late on Thursday . Europe's broad FTSEurofirst 300 index (.FTEU3) closed up 1 percent to 1,447.22. Germany's DAX (.GDAXI) rose 0.94 percent and Britain's FTSE 100 (.FTSE) rose 0.62 percent, its 14th consecutive daily gain. MSCI's broadest index of Asia-Pacific shares outside Japan <.MIAPJ0000PUS> slipped 0.1 percent after rising to its highest since late October the previous session. It was up 1.8 percent for the week. Japan's Nikkei stock index (.N225) finished up 0.8 percent, though it still ended the week down 0.9 percent. Brent crude (LCOc1) was down 0.8 percent at $55.59 a barrel, while U.S. crude (CLc1) fell 0.9 percent at $52.53. Spot gold (XAU=) was up 0.2 percent at $1,197.90 an ounce, having risen overnight to a seven-week high above $1,200.